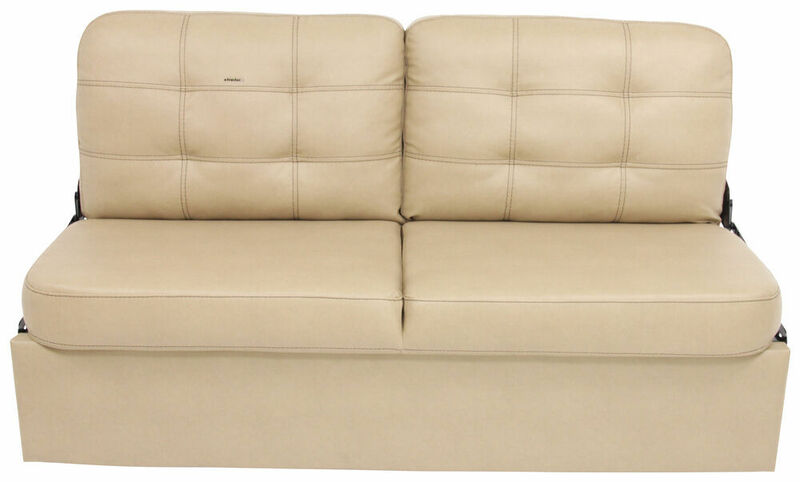 This RV sleeper sofa with PolyHyde Euro leather vinyl upholstery easily converts into a bed. Leg kit is designed for RVs without a pre-existing platform or frame. Padded backrest lets you sit or sleep in comfort. Kickboard and hardware are included. 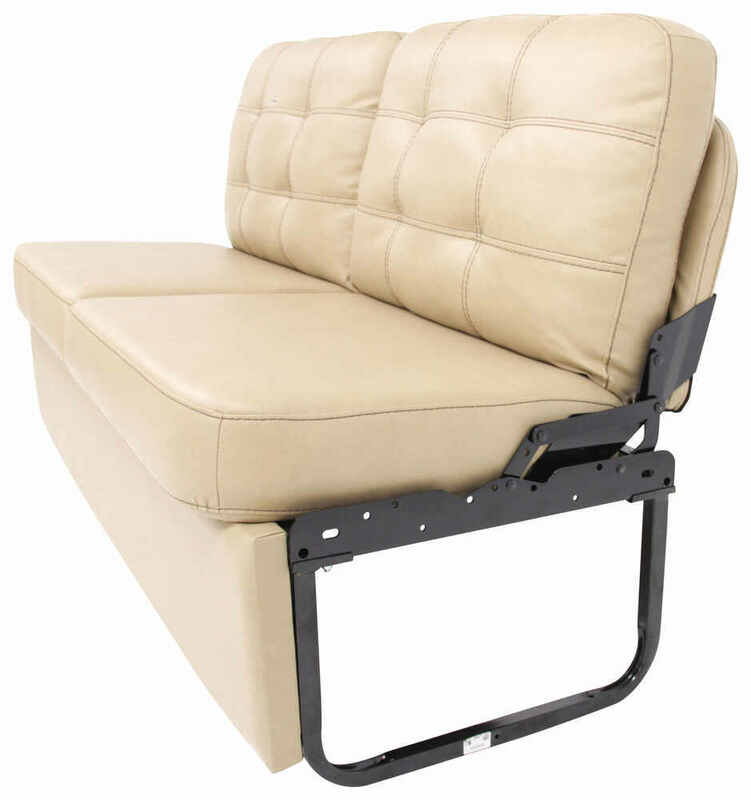 Lowest Prices for the best rv couches and chairs from Thomas Payne. Thomas Payne RV Jackknife Sofa w/ Leg Kit - 62" Wide - Pivot Harvest part number 195-000009-017 can be ordered online at etrailer.com or call 800-298-8924 for expert service. 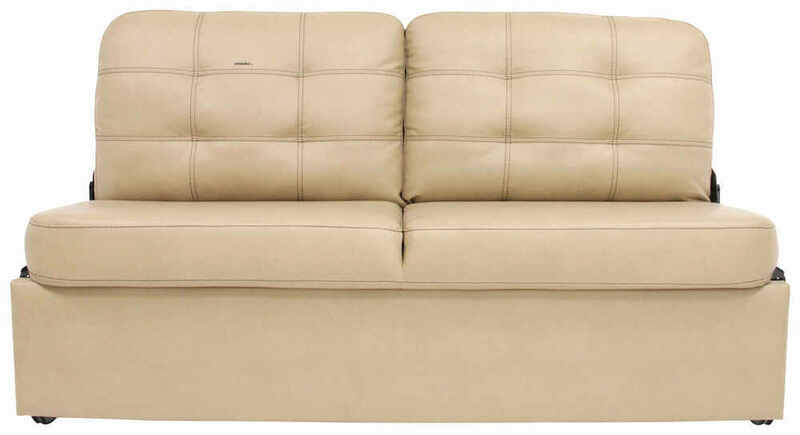 This RV sleeper sofa with PolyHyde Euro leather vinyl upholstery easily converts into a bed. Leg kit is designed for RVs without a pre-existing platform or frame. Padded backrest lets you sit or sleep in comfort. Kickboard and hardware are included. This jackknife sofa lets you kick back and unwind in your RV or camper. This sofa can convert to a bed, which makes it perfect for napping, watching TV, or simply just relaxing after a long day. The padding on the backrests allow you to sit or sleep in ultimate comfort. Convert this sofa into a bed in 3 easy steps to provide an additional sleeping surface in your RV. Lift the seat up, pull it forward, and then push both the seat and the backrest down until they are flat. To turn the bed back into a couch, use the same steps but in reversed order. This sofa includes a universal leg kit. This means that is it designed for RVs and campers that don't already have a pre-existing platform or frame. Because of this, some minimal assembly is required. Hardware is included. Once assembled, there is a storage area underneath the sofa, which allows you to save room elsewhere on your RV. The kickboard installs along the front of the leg kit, and it's removable so you have easy access to your belongings. This sofa has luxurious PolyHyde Euro leather vinyl upholstery with a polymer coating. This is a low-maintenance material, which makes it extremely easy to clean up after kids and pets. The interior of the sofa is made up of high-density foam components. And the simple, high-contrasting stitching pattern offers an overall clean and stylish look. 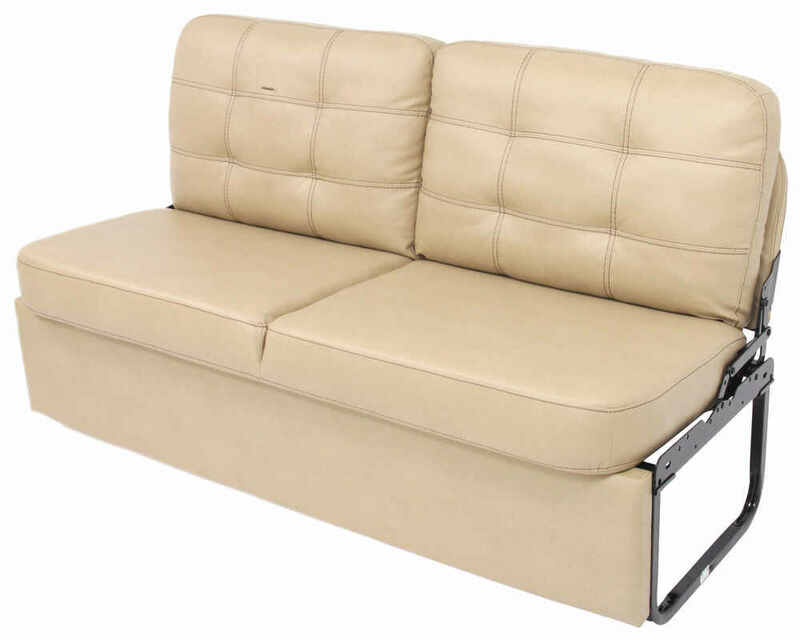 This RV sleeper sofa with PolyHyde Euro leather vinyl upholstery easily converts into a bed. Padded backrest lets you sit or sleep in comfort. Mounts to pre-existing platform or frame in your RV with the included kickboard and hardware. This RV sleeper sofa with low-maintenance PolyHyde Euro leather vinyl upholstery converts into a bed in 3 easy steps. Padded seat, backrest, and armrests let you sit or sleep in comfort. Couch requires minimal assembly. 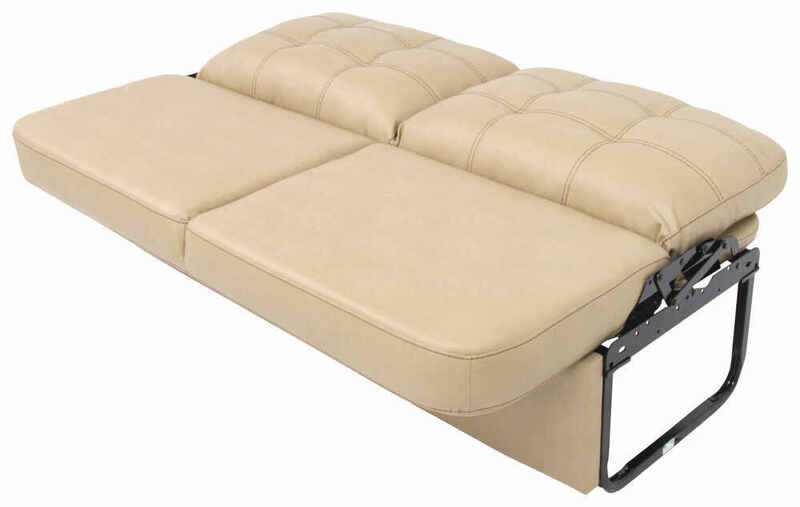 Today we're going to be taking a look at the Thomas Payne 62" Jackknife Sofa with kick board legs for RVs and campers. It's available in five different colors to compliment your interior. In melody walnut, part number 195-000008-017, in pivot harvest, part number 195-000009-017 and finally in poise dark chocolate, part number 195-000011-017. Upgrade your RV's interior with this sofa. It's a sofa by day, and it easily converts to a bed by night. Simply lift up on the front, guide it out, and drop it down. The cushion padding and high density foam is going to provide a comfortable sleeping area. It's made with a polyhyde material with high contrast stitching for added style. If you're concerned with space or drawers underneath, the kick board can easily be removed. With the kick board removed, now is the perfect opportunity to show you the legs. They're attached right here at the base. Down here, they feature two mounting locations, 12" apart. You will have to provide your own hardware. We'll go ahead and give you some measurements just to help you determine if it's going to be a right fit for you. It's 35.5" tall, 29" deep and it's of course, 62" long. In order to fold it down to the bed position, you need to have at least an inch and a half of clearance here at the rear. Also, when it folds down to the best position, you'll need an additional 9" of clearance. With it in the bed position, you have 62x42" of surface area. The base is 20" long, and the legs are 12" high. That's going to complete our look at the Thomas Payne 62" jackknife sofa with kick board and legs. Order: RelevanceNewestRating - High to LowRating - Low to High This RV sleeper sofa with PolyHyde Euro leather vinyl upholstery easily converts into a bed. Leg kit is designed for RVs without a pre-existing platform or frame. Padded backrest lets you sit or sleep in comfort. Kickboard and hardware are included. In the video it does state you only need 1-1/2 inches clearance for the Thomas Payne RV Jackknife Sofa, part # 195-000013. The distance you need from the base of the sofa as noted in the attached photo is 9-inches from the wall. The distance at the top of the back of the sofa is closer to the wall and that is where the 1-1/2 inch measurement came from. The Thomas Payne RV Jackknife Sofa # 195-000009 does not move 9 inches. The 9 inches is the required wall space the sofa need to be able to open up and be used as a bed. 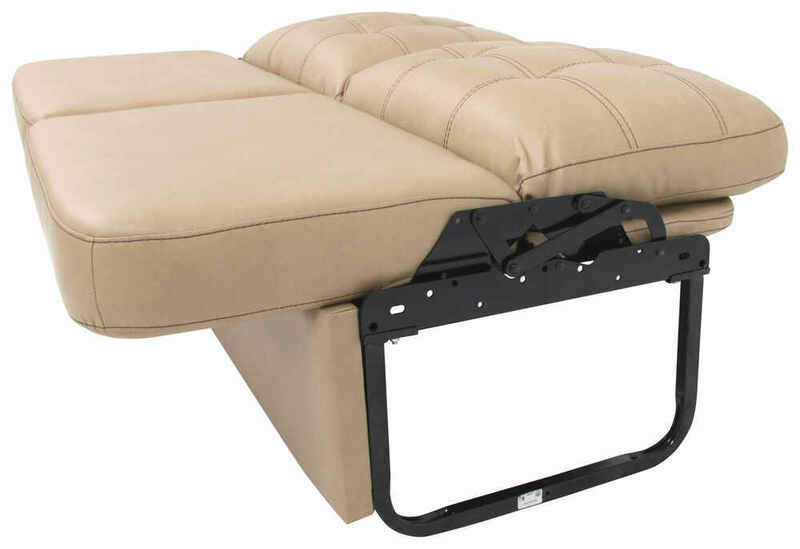 We also carry the Thomas Payne RV Jackknife Sofa with Leg Kit # 195-000009-017. This includes the matching kickboard and leg kit for the sofa. The leg kit # 195-000017 can be purchased separately. The cushions are integrated into the Jackknife sofa # 195-000009-017 so they can't be easily removed. The sofa is designed to be able to be carried in and out of an RV/trailer door so it would not be all that difficult to carry it through your 29 inch door. The legs will not be attached when it is delivered so you would carry in the seating portion and the legs separately and assemble it all inside the RV/trailer. Unfortunately, material is not available separately for the Thomas Payne RV Jackknife Sofa - Pivot Harvest # 195-000009-017. However, pivot harvest is just a fancy way of saying light tan, so I cannot imagine you will have any issues finding suitable material that will match so you can upholster accompanying pieces. In order for the Thomas Payne RV Jackknife Sofa # 195-000009-017 referenced in your question to fold down into its bed position, you will just need 1-1/2 inches of clearance between the back of the sofa and the wall. On the front end, you will want to make sure you have at least 9 inches of clearance from the bottom of the sofa to any other obstructions/items in the camper. I have attached a couple images to clarify these dimensions. The seat height for the Thomas Payne RV Jackknife Sofa with Leg Kit # 195-000009-017 is 16-1/4 inches. Is Thomas Payne Jacknife Sofa Available in 66 Inches Wide? The Thomas Payne RV Jackknife Sofa - 68" Wide - Pivot Harvest # 195-000014 is not available in 66 inches wide. It is only available in the 68 inch or 62 inch # 195-000009 or # 195-000009-017 with legs and kickboard. 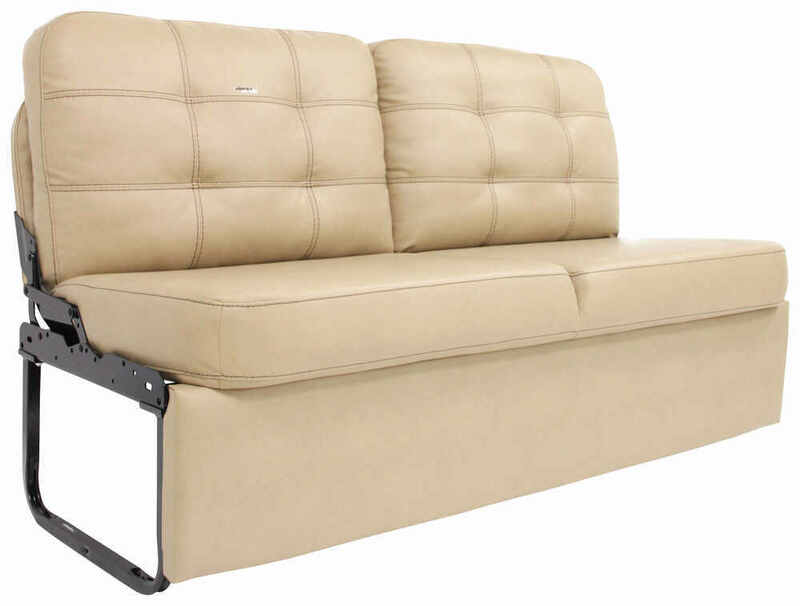 For a 66 inch sofa, you may want to consider the Thomas Payne RV Dual Reclining Sofa w/ Center Console - Grantland Doeskin # 195-024-025-026 which is the only option we have for a 66 inch wide sofa in that tan color. Yes, the Thomas Payne RV Jackknife Sofa # 195-000009-017 will fit in your doorway. These sofas are designed for fitting through the tighter doorways of RVs and would be able to be fit through your door. Worst case scenario you assemble it inside the sleeper. The Thomas Payne RV Jackknife Sofa w/ Leg Kit # 195-000009-017 that you referenced weighs 102 lbs. Overall the Thomas Payne sofa # 195-000009-017 is 62" long x 29" deep x 35-1/2" tall. So it is slightly longer and deeper than your 24 by 60 inch box. We do have # 195-000002 which is 60" long x 33" deep x 38" tall so it is deeper but at the 60 inch length. So provided the new sofa can stick out a little further than the box does this is a solid option for you. Highest quality rv couches and chairs for the best price. 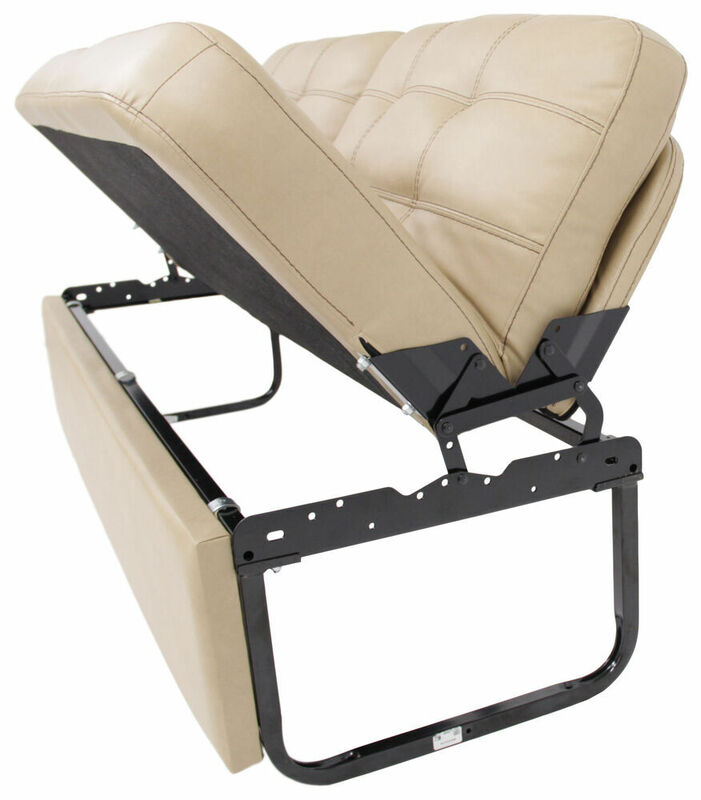 Most detailed, accurate rv couches and chair information available.